The 140th anniversary year of St. John’s Parish Church in Ballycarry will be marked as part of this year’s Broadisland Gathering festival. A special recital night is being held there on Thursday, August 31, starting at 8.00 pm. There will be readings as well as performances by Larne Choral Society, flautist Ami Ogilby and folksinger George McKnight from County Down. 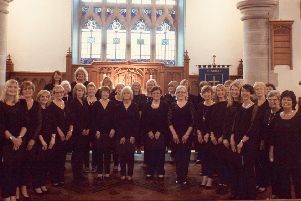 Larne Choral have performed at a number of past Gatherings while Mr. McKnight sang many years ago in the village at a folk club organised by the late Rev. Robin Williamson in the Old Presbyterian Church Hall. Ami Ogilby will be making her debut at the festival. A mix of local songs, folk and also some wartime material will be performed with some readings on local themes. The festival organisers said that in addition to the significant anniversary of the local church, the acoustics in the 1847 building lent themselves to the type of evening which is planned. Tickets for the event are priced at £5 and available from CF Beattie, Main Street. The following evening, Friday, September 1, the community centre in the village will be the venue for a cookery night hosted by local woman Arlene Thompson. Arlene will be joined by ‘celebrity chef’ of the evening, East Antrim MP Sammy Wilson for the event which also starts at 8.00 pm. Tickets are £5.00 and also on sale from CF Beattie, of Main Street, or people can pay at the door. The main events for the Gathering will take place on Saturday, September, with headline groups Stonewall, Risin’ Stour, Scad the Beggars and, for the first time, an Irish folk group, Na Leanai from Rostrevor, adding to the line-up during the afternoon. Well-known comedian and broadcaster Tim McGarry will also be coming along to the event and spending some time meeting performers and visitors to the event, while the organisers say that the Auld Country Fair looks set to be the largest to date. Events get underway at 12 noon and continue until 5.00 pm. There will be events on the Main Street, from 12 noon, with diversions around the village. At 4.00 pm, a parade of townland banners will leave Brackenberg estate and make its way through the centre of the village to St. John’s Church, where the main pageant parade will form up for 5.00 pm and make its way to the Fairhill. Vintage vehicles will also be on the road at 1.00 pm and after 3.00 pm to help mark the 25th anniversary of the event.